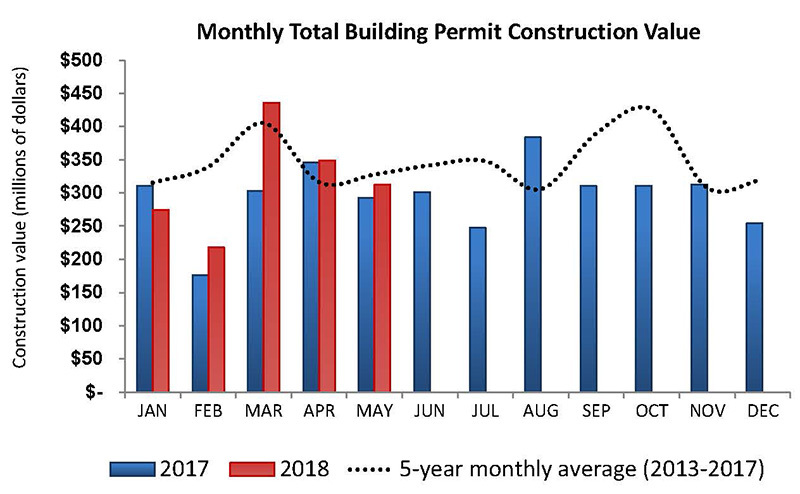 The Monthly Building Permit Report provides frequent and up-to-date information on construction trends in Edmonton, based on building permits issued by the City of Edmonton. The report also shows year-to-date values and provides a comparison to the previous year and the five-year average. Construction values represent the estimated construction value of issued building permits and are not actual construction starts. Values for the Edmonton region include all surrounding cities, towns, and villages, as defined and reported by Statistics Canada. Please refer to General Building Permits on Open Data for more detailed information. The 2017 annual building permit summary includes comparisons to 2016 figures and five-year averages, and lists building permit approvals greater than $10 million in value. The 2016 annual building permit summary includes comparisons to 2015 figures and five-year averages, and lists building permit approvals greater than $10 million in value. The 2015 annual building permit summary includes comparisons to 2014 figures and five-year averages, and lists building permit approvals greater than $10 million in value. Building reports include the number of building permits issued, residential units and construction values (sorted by commercial, industrial, institutional, residential and miscellaneous construction). Development Services provides quarterly progress and activity reports to stakeholders and the public.